C’est simple comme bonjour ! or “It is as easy as saying hello”. I swear that this is an expression that we use. I had not used it in so long! The idea of adding vanilla to celery root had been with me for a while. I knew for a long time that these two ingredients would fall in love with each other. When I brought the dish to the table, I told P. that I had a surprise. I asked him if he could guess what ingredient I had added to my celery mash, knowing well that I was not being fair on him. P. is not one of these people who are good at food blind tests. But as the two of us like to play this silly game anyway, he tried. After a few attempts, he finally gave in and begged for the answer. “C’est de la vanille”, I said, to which he responded immediately “Ah mais oui, évidemment, je le savais” (I knew it!). Of course, easy for me to say that it should have been obvious to him when I had cooked the dish. But the truth is that I really believed that it was not possible to confuse the vanilla flavor with anything else. The power of the spice was definitely present. Since I have always enjoyed to prepare celery root, whether in salads, soups, steamed, in gratin, braisé or mashed, I was pretty happy with my experiment. Can you really resist any type of vegetable mash? I can’t. A smooth warm texture melting in the mouth? Ah yes, please! If kids like it, their reason is good. 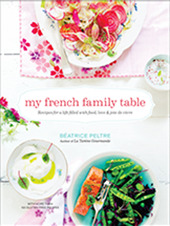 While searching for ideas for the holidays, I imagined this accompaniment dish. Extremely simple to make, with a twist that makes it stand out from the more traditional vegetable mash. 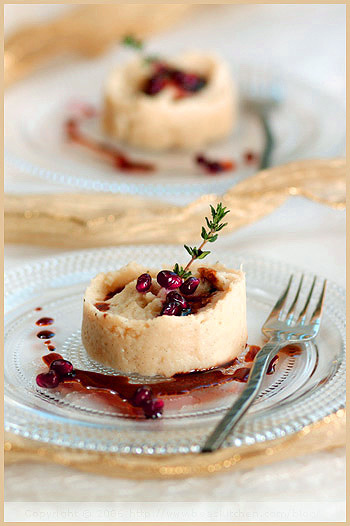 I cooked the celery root in milk infused with fresh vanilla and thyme, and added fresh pomegranate seeds. Like many root vegetables, celery root has natural sweetness that matched perfectly vanilla. As I remembered a bottle of pomegranate molasses bought a while ago, I thought this celery mash was going to be a good place to make use of it. Needless to say that it worked as a charm. The more acidic touch brought by the sauce balanced the sweetness of the vegetable mash whereas the fresh pomegranate seeds were a good contrast in texture, bringing crunchiness into the smoothness of the mash. I was pretty excited to have a dish that would be a great addition to one of the holidays menus. I cannot wait to try it again! And of course, I hope that you like it! If you do not cook celery root often, this is a good place to start. *If you cannot find pomegranate molasses — I find mine in a Lebanese delicatessen — I suggest buying pomegranate juice (or freshly pressed) and reducing it on low heat until the consistency is syrup-like. Heat the butter and olive oil in a sautée pan and cook the celery root (washed, peeled and cut in big chunks) for 5 mns. Add the milk. Cut the vanilla pod and scrape the seeds out. Add them to the milk with the thyme. Cook on low heat until the vegetables are tender. When you reach that point, remove the vanilla pod and thyme sprigs and mix the vegetable with the milk (use a food processor or a hand mixer). Season with pepper. Heat the pomegranate molasses on low heat. 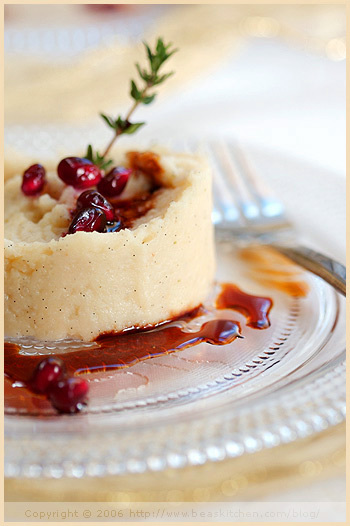 Serve the mashed celery with fresh pomegranate seeds and the pomegranate sauce. Sprinkle with fleur de sel. *Si vous ne trouvez pas de mélasse de grenade — je trouve la mienne dans les épiceries libanaises — je suggère d’utiliser du jus de grenade (acheté ou fraîchement pressé) et de le faire réduire sur feu doux jusqu’à l’obtention d’une consistance sirupeuse. Faites fondre le beurre et l’huile d’olive dans une sauteuse et faites revenir le céleri lavé, épluché et coupé en gros morceaux pendant 5 mns. Ajoutez le lait, la gousse de vanille fendue et grattée et ses graines, les brins de thym, et faites mijoter à feu doux jusqu’à ce que les légumes soient tendres. À ce stade, mixez les légumes avec le lait. Poivrez. Faites chauffer la mélasse de grenade sur feux doux. Servez la purée avec la sauce et des graines de grenade. Ajoutez de la fleur de sel. Je n’aurais pas imaginé que la vanille domine le céleri. Belle photo et jolie recette ! Mmmmm. I had a vanilla infused parsnip puree at Thanksgiving that was just wonderful…as I imagine this is too! Spectacular! I actually do have a celery root sitting in my fridge at home, maybe I will cook it up tonight into a simpler version of this dish. Je suis tombée amoureuse de la photo et de cette douce description! I absolutely love celery root and my mouth is watering just imagining this. Wow wow wow! And the photo introduction is just stunning, as always! 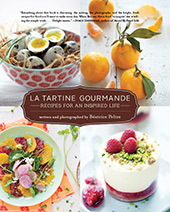 Will you please please please make a cookbook? I’d be your very first buyer! Now that you bring them together I can see these flavors would be excellent together. I’ve enjoyed celery root in restaurants but not tried cooking it myself. This would be the place to start. je suis archi fa, du celeri et quelle belle idée (encore!) que cette association avec vanille et granade! I only tried celery root once, but this is an interesting combination of flavors. what a lovely and unique idea. appealing to all the senses! I love your holiday styling! There are too many gorgeous ribbons and papers to choose from at the store, I’m going crazy! WOW, quelle photo et que ça a l’air bon. Je note la recette. Great Idea Bea!! I just made a batch of celeriac puree yesterday, next week I will try it your way. I got the pom syrup at the Turkish store in town. I wish I had a Lebanese store, I would be in heaven! Happy Holidays!!! Superbe photo! Elle donne une envie folle de tester ta recette au plus vite! When I first saw it I actually thought it was a little tart, it was definitely a surprise to discover it was celery! What can I say, you just turn out one gorgeous picture after another. I like pomegrenate and your recipe is very unique! Vanille & céleri, en voilà une belle alliance ! Merci Lena. C’est vrai que cela peut surprendre. Mais cela le fait d’une facon subtile. Peabody, oh I bet the puree you had must have been divine! Gluten-Free By the Bay, thank you! I hope you will like it! Matt, oh you are someone. Thank you very much. I promise to keep a copy when it is out! Find me the “damn” publisher! Tanna, oh I hope you try this vegetable. As a salad to start with, it is wonderfully simple and delicious. Krista, if you try, I ope you like it. I wonder what your first try was like. Connie, thank you. I am glad you like the idea. Anita, thanks my dear! Ah yes, this time of year is perfect for us lovers of fabrics of all sorts! Riana, oh, I cannot wait to hear what you think. Happy holidays to you too! Lorette, J’avais fait du canard avec, et du poisson une autre fois. Gattina, ahhah, if you say so, I will take your word. I will make sure to remind him next time he gets grumpy with me! Brilynn, thank you! Good point taken. It could well have been tartlets! Veron, thank my dear. I feel flattered! Janelle, this salad sounds very tasty too. I like them together as a matter of fact. early Xmas gift? Lucky you! I am not allowed to open. Je vois le titre, je clic sur ta page en paff, j’arrive sur ta 1ère photo et là…..le trou noir….j’ai du tombé de ma chaise en voyant cette merveille 😉 C’est juste splendide et l’association céleri et vanille doit etre parfaite!!! Un grand bravo ! C’est merveilleux ! Tu as déjà une tonne de compliments, je ne sais donc que dire de plus à part Bravo ! Je ne suis pas certaine de trouver de la grenade et encore moins de la mélasse de grenade mais cela vaut le coup de chercher. Merci pour cette inspiration. Merci Cuisine Pop. J’espère que tu seras chanceuse dans tes recherches. Nice Fanny. This is a compliment then! Qui est capabler de me faire rever sur du celeri, a part toi? this is such an inspired combination! I love pomegranate molasses. It’s a perfect holiday dish. Like a clock. The sound of true love ticks in the heart. you are an inspiration for people. I just find your blog but I was impress. My father’s and my brother’ birthday will be soon and I will try some of the recipes post on your blog.